AirAsia X is further slowing growth as the long-haul low-cost group battles challenging market conditions. AirAsia X’s fleet is now slated to only grow by three aircraft over the next three years, leading to a much slower than anticipated build up for its new affiliates in Indonesia and Thailand. AirAsia X has now been in the red for seven consecutive quarters, accumulating net losses of USD270 million including USD36 million in 2Q2015. The group has been in restructuring mode since late 2014, leading to a 20% drop in passenger traffic in 2Q2015. Unfavourable market conditions and unexpected external factors have delayed a hoped for turnaround. But AirAsia X is confident it will be back in the black in 2H2015, boosted by capacity cuts at Malaysia Airlines; any new unforeseen external factors could however be painful. Malaysia AirAsia X (MAAX) reported on 18-Aug-2015 an operating loss of MYR100 million (USD27 million) and a net loss of MYR133 million (USD36 million) for 2Q2015. The operating loss was slightly less than the MYR116 million loss (USD32 million) from 2Q2014 but the net loss increased slightly from the MYR129 million figure (USD35 million) from 2Q2014. 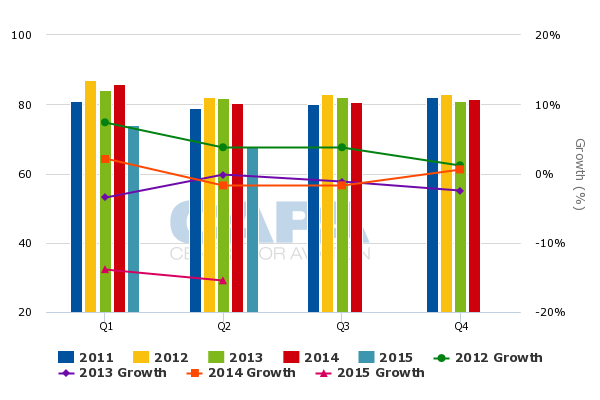 These figures exclude the new affiliates in Thailand and Indonesia, which launched in 2Q2014 and 1Q2015 respectively. Thai AirAsia X (TAAX) incurred a net loss of USD3 million in 2Q2015 while Indonesia AirAsia X (IAAX) incurred a loss in 1H2015 of USD18 million. RPKs at the Malaysian operation were down 23%, outstripping a 9% drop in ASKs as load factor slipped an alarming 12ppts to only 68%. Average fares and yield improved by 7% following an adjustment in AirAsia X’s pricing strategy that began in late 2014 aimed at restoring yields to more sustainable levels. Yields plummeted through the first nine months of 2014 due to ambitious capacity expansion and intense competition. But the renewed focus on yields has come at the expense of load factors despite a sharp reduction in capacity. Malaysia AirAsia X’s passenger load factor dropped 12ppts to 74% in 1Q2015 and the 68% figure for 2Q2015 marks the first time the carrier’s load factor has dipped below 70%. Over the last 18 quarters there was only one other time MAAX’s load factor was below 80% – back in 2Q2011 the carrier had a load factor of 79%. A 68% load factor is clearly unsustainable for any long-haul LCC. But AirAsia X sees the low load factors from 1H2015 as a reflection of unforeseen external factors and believes it can improve its load factor back to its historic norms without yields slipping back to 2014 levels. AirAsia X partially blames the impact of the 28-Dec-2015 crash of an Indonesia AirAsia (IAA) A320, which impacted 1H2015 bookings across the AirAsia brand as marketing activities were halted in early 2015. But short-haul sister carrier Malaysia AirAsia (MAA) was able to maintain an 80% load factor in 2Q2015 and even IAA saw its load factor slip a relatively modest 5ppts to 73%. AirAsia X also cited the sharp decline of the Malaysian ringgit, brand damage in Australia stemming from the last-second postponement of Bali-Melbourne flights, the earthquake in Kathmandu and the MERS outbreak in South Korea as impacting demand in 2Q2015. AirAsia X had to cancel 28 flights in 2Q2015 on its five times weekly Kuala Lumpur-Kathmandu route and cancelled 40 flights in Jun-2015 and Jul-2015 to South Korea, which it serves with two daily Seoul Incheon flights and four weekly Busan flights. AirAsia X said the problems in Korea drove a 16% reduction in North Asia yields in 2Q2015 while its other markets saw a large yield improvement. The Nepal earthquake and MERS outbreak are short-term issues while AirAsia X is hoping a combination of capacity cuts at MAS and brand restoration initiatives improves its performance in Australia. MAAX recorded a loss before tax on Australian routes of MYR71 million (USD19) for 2Q2015 while North Asia routes incurred a loss before tax of MYR161 million (USD44 million). 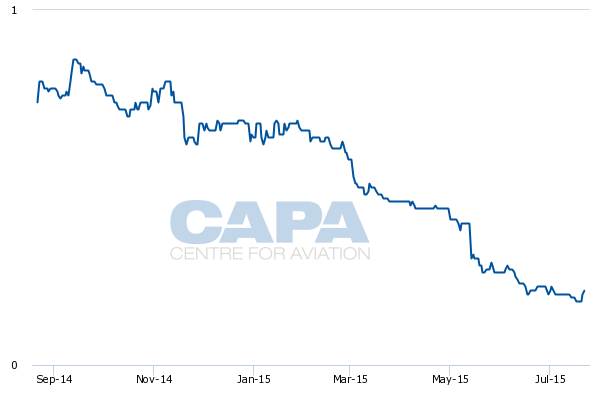 As CAPA previously highlighted, MAS is cutting capacity in the Malaysia-Australia market by 40% in Aug-2015. This follows a 36% capacity cut by MAAX, which now serves Australia with 34 weekly flights to four destinations compared to 54 weekly flights to five destinations one year ago. But AirAsia X could struggle to boost load factors on Australia routes while maintaining yields, which were up by 17% in 2Q2015. The weak Australian dollar, which accounted for about 20% of MAAX’s revenues in 2Q2015, is impacting outbound demand. Competition also remains intense even with the capacity cuts at MAS. MAS’ Australian operation has traditionally relied heavily on European traffic. For example about two thirds of MAS passengers from Brisbane, which is the only Australian destination being entirely cut by the flag carrier, connected onto flights to Europe. The void left by MAS in Brisbane-Europe and broader Australia-Europe market is expected to be primarily filled by Gulf carriers and to a lesser extent other Asia Pacific full-service carriers. MAS will continue to compete head to head with AirAsia X in the local Melbourne, Perth and Sydney to Kuala Lumpur markets as well as in connecting markets within Asia. MAS is cutting capacity to Melbourne, Perth and Sydney but due to its network cuts in Europe it is focussing less on Australia-Europe traffic while still maintaining a relatively significant presence in the Australia-Malaysia and Australia-Asia markets. MAAX remains heavily exposed to Australian routes, which accounted for 27% of its revenues in 2Q2015. In 2Q2014 Australian routes accounted for 35% of MAAX’s revenues. AirAsia X also competes against MAS on seven of its current 13 non-Australian routes including Beijing, Colombo, Kathmandu, Osaka, Tokyo Narita, Seoul and Taipei. But MAS has only included one of these markets, Taipei, in the wave of capacity cuts being implemented in Aug-2015. AirAsia X is suspending services in one of these markets, Tokyo Narita, from 19-Aug-2015. The decision to pull out of Narita was made after it realised MAS was not including the Tokyo market in its capacity cuts. AirAsia X was also concerned about potential overcapacity in the Kuala Lumpur-Tokyo Narita market following the 1-Sep-2015 launch of services from All Nippon Airways. AirAsia X will continue to serve Kuala Lumpur-Tokyo Haneda with one daily flight while Narita will continue to be served by TAAX from Bangkok with a potential new Bali-Narita service from IAAX planned for 4Q2015. Overall MAS is reducing international seats by 18% and international ASK by 23% but the impact on MAAX’s South Asia and North Asia operations is minimal, potentially limiting AirAsia X’s ability to turnaround. AirAsia X has not received the advantage of North Asia capacity cuts it was expecting MAS to make. MAAX should still see some improvements in the South Asia and North Asia markets, particularly if there is no new external factors such as earthquakes and outbreaks of communicable diseases. But such external factors are hard to predict and with AirAsia X in a weak financial position following seven consecutive quarters of losses it cannot afford any more unexpected surprises. AirAsia X’s stock price is down about 70% over the last year and is trading more than 80% below its Jul-2013 IPO price. As of 22-Aug-2015 the stock was trading at only MYR0.17 (USD 4 cents). Several investment firms have reduced or underweight ratings on AirAsia X and some are labelling the airline group a risky investment. AirAsia X is responding to the challenging conditions by implementing several turnaround initiatives and significantly slowing expansion. In releasing 2Q2015 results the group revealed cancellations for 12 A330ceo aircraft without any penalties imposed by Airbus. The cancelled aircraft, which would have been delivered in 2016 to 2018, follow earlier A330-300ceo deferrals and sale of several aircraft in late 2014 and early 2015. The AirAsia X Group currently operates 26 A330s and following the 12 cancellations is now committed to receiving only three additional A330ceos over the next three years. This includes one aircraft which will be delivered in Sep-2015 and two aircraft which are now slated to be delivered in 2016. The revised AirAsia X fleet plan does not have any deliveries for 2017 or 1H2018. Following the modest two aircraft for 2016, deliveries will resume in late 2018 when the first batch of two A330-900neos are slated to be delivered. After the initial deferral announcement in Nov-2014 AirAsia X was projecting a fleet of 40 A330ceos before taking its first A330neo. The group now plans to have only 29 A330ceo before transitioning to the A330neo. The new adjustment to the fleet plan is sensible given the current challenging environment and the improved efficiencies that come with the A330neo. AirAsia X remains committed to acquiring over 50 A330-900neos with the first two aircraft slated for late 2018 followed by five aircraft in 2019, seven aircraft in 2020 and 2021 and eight aircraft per year from 2022. AirAsia X is still expecting to double the size of its fleet by 2026 but most of the growth will not occur until next decade, particularly if the group elects to use the initial A330neos to replace A330ceos. The significant slowdown in deliveries over the next three years will particularly impact the rate of growth at the two new affiliates. AirAsia X initially planned a fleet of 10 aircraft for both IAAX and TAAX within three and at most five years. AirAsia X Group business development manager Siva Ramanathan told CAPA TV on the sidelines of the CAPA Australia Pacific Aviation Summit on 5-Aug-2015 that it will now take more than five years for the new affiliates to reach the 10 aircraft level. TAAX currently operates four A330-300s and IAAX only two A330-300s. The original fleet plan for 2015 envisioned TAAX ending 2015 with seven aircraft and IAAX with three aircraft while the fleet plan for 2016 envisioned TAAX with nine aircraft and IAAX with four aircraft. The group no longer has the capacity to allocate 13 additional aircraft to its affiliates by the end of 2016. But the affiliates are still expected to receive the three remaining A330ceo deliveries and could also receive some additional aircraft through subleases from MAAX. MAAX currently operates 20 A330-300s but three of these aircraft are currently used for charters and wet leases. MAAX is only committed to charters and wet leases through 3Q2015, giving it spare capacity to expand its scheduled operation in 4Q2015. Some of this capacity has already been allocated with additional flying from Kuala Lumpur, including a new four times per week service to Sapporo in Japan from 1-Oct-2015 and the planned 1-Nov-2015 launch of four weekly flights to Honolulu via Osaka pending approvals from US authorities. Mr Ramanathan told CAPA TV that the group continues to look at other niche opportunities to grow the network from Kuala Lumpur as well as more secondary cities in China and Japan. But the main focus for AirAsia X over the next few years will be on expanding the network from the newer and much smaller hubs of Bangkok and Bali, where growth is still planned for 2H2015 despite the slowdown in fleet growth at TAAX and IAAX. TAAX currently serves Osaka Kansai, Seoul Incheon and Tokyo Narita and is planning to add services to Australia, China, Iran and Russia. Expansion to Korea and Japan could resume in 2016 if Korean and Japanese authorities lift current ICAO-related restrictions blocking new flights from Thai carriers. IAAX currently serves Melbourne and Taipei and recently confirmed the launch of five weekly flights to Sydney from 17-Oct-2015. New routes to Auckland, Brisbane, Jeddah, Tokyo Narita and potentially China are in the pipeline. AirAsia needs AirAsia X. Is a merger a possible outcome? There are still plenty of opportunities for medium/long-haul growth from all three AirAsia X bases. AirAsia X also has an important strategic role within the AirAsia family, opening up new destinations which cannot be served with narrowbody aircraft and providing valuable feed for the short-haul affiliates. In 2Q2015 over 150,000 MAAX passengers transferred via the AirAsia Fly-Thru product onto flights operated by Malaysia AirAsia (MAA). About 40% of MAAX passengers connect onto MAA or other MAAX flights (including self-connections). Connections with Thai AirAsia in Bangkok and Indonesia AirAsia in Bali are just starting with huge growth potential as the TAAX and IAAX networks expand. Strategically AirAsia needs AirAsia X. The turnaround initiatives and slowdown in expansion are sensible but if they do not succeed at righting the ship AirAsia may need to step in. A merger with AirAsia X is something AirAsia has always wanted to avoid as it would dilute the value of the main listing. AirAsia also currently has its hands full with two new affiliates (India and soon Japan) and turnaround attempts at two other short haul affiliates (Indonesia and the Philippines). But ultimately a takeover of AirAsia X or merger may be the only option if AirAsia wants to maintain a presence in medium and long-haul markets. Reverting to an entirely short haul operation after eight years of pioneering the long haul low cost model is hardly an option.